Arby's has the Arby-Q sandwich back on the menu through October 5, 2008. It is priced at 99 cents. 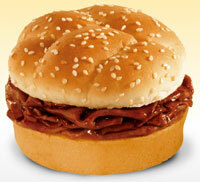 The Arby-Q has Roast Beef in BBQ sauce on a toasted sesame seed bun.